Good to run into lots of friends and colleagues – old and new – at London Rare Books School last week. Not least, Paddy Elliott of Madoc Books in Llandudno. I mention him in particular because Llandudno (handsome seaside resort on the north coast of Wales, for those whose geography isn’t all it should be) bubbled to the surface again just a few days later. 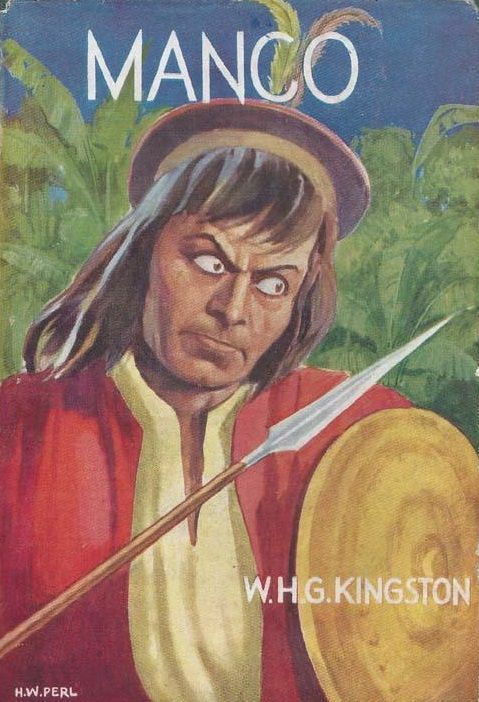 I was asked if I knew anything further of the author and publisher Hyman Kaner of Llandudno, whom I mentioned a few weeks ago as one of the publishers who commissioned artwork from H. W. Perl. Well, no – not really – but the various available accounts of him are all a little sketchy and I can fill in a few gaps. And it’s an excuse to show some more Perl covers. Kaner first surfaces on the 1901 Census returns as the five-year-old Haim Isaac Kaner, eldest son of Carol Kaner and his wife Debora or Deborah, née Weisental. All three were born in Romania, but by this time were living in London. A family tree gives Hyman’s place of birth as ‘Gulatz’ – presumably the large port of Galați on the Danube. Carol Kaner had a tobacconist’s shop at 48 Cambridge Road, Mile End, where the family lived with a second son, Israel Isidore Kaner, who had been born in London two years earlier. A surviving school admissions record shows Hyman Kaner being enrolled at Enfield Road School in Hackney on 19th March 1906, noting his date of birth as 19th August 1896 (a date later given as 13th August 1896 when he died in 1973 – I’m not sure which is correct). His previous school had been Settles Street, where Perl himself was a pupil for a short time. Kaner stayed at Enfield Road until 1908 and, as we shall see, his early education evidently served him well. In 1911 the Kaners were living in cramped accommodation (just three principal rooms) at 141 Balls Pond Road, Islington. Carol (now Charles) Kaner is no longer a tobacconist but working as an assistant in a draper’s shop. In a marriage of fifteen years, five children in all had been born, with four still living – the boys Hyman and Isidore, as they are now named, have been joined by daughters Rosie and Vera. By the 1920s, Hyman Kaner was still living at home with his parents at addresses in Bethune Road, Stoke Newington, and Sanderstead Avenue, Hendon, but in 1926 he married Lily Hashfield (1902-1965), the London-born daughter of a Russian mechanical engineer and his Polish wife. Her father, Morris Hashfield, generally in tandem with his business partner Hermann Allbrook, is known for a number of patents taken out for improvements relating to sewing-machines, double-loop stitching, chain-stitching, fur and glove sewing, looper-shafts, machine-stitched buttonholes, mechanical embroidery, etc. Two sons, Philip Gerald and Peter Alan Kaner, were born 1927 and 1929, both births registered at Edmonton, as was the marriage. The birth of a daughter, Daphne, was registered at Hendon in 1933, but in the interim the Kaners had been living at Leigh-on-Sea, on the Essex Coast, where Hyman Kaner was recorded in directories as Hyman Kaner, B.Sc., A.S.A.A., incorporated accountant. He is generally reported to have been a civil servant, rather than an accountant, but both were probably true at different periods. In 1937 his “A New Theory of Goodwill” was published by Pitman – this must be ‘goodwill’ in the business sense used by accountants, rather than some utopian scheme for spreading happiness: it was followed in 1938 by “Balance Sheets Explained, Analysed, and Classified : A Guide for Investors, Professional Men and Students”, again published by Pitman. The family had been living in North London – Clifton Road in Crouch End, then Cranbourne Gardens in Hendon in 1938-1939, but Kaner next appears in Llandudno. He was presumably among the 5,000 employees of the Inland Revenue (plus their families) who were sent there as a perceived safe area in 1940. Apparently over 400 hotels and guest-houses were requisitioned to accommodate them, while a similar number of civil servants from the Ministry of Food descended on nearby Colwyn Bay (someone must have written a comic novel about this, surely). 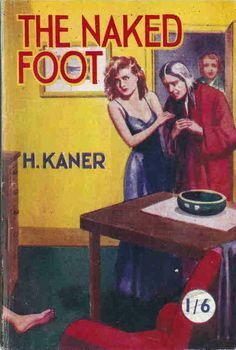 In or about 1944, Kaner began to write and publish his own work – a very mixed bag, mainly but not exclusively crime, mystery and science fiction. As a number of the books are undated the sequence is far from clear. Some appeared in hardback, some in paperback, some in both forms. I suspect his first essay at self-publishing was in fact “Is Capitalism a Failure?”, billed as the first title in the “Progressive Thought Series”, printed for him by a local firm in Conway and the only one of these titles not expressly published by the Kaner Publishing Co. I am not at all sure that any more titles appeared in the series, and he seems quickly to have decided that he might make his points better by the use of fiction. The topically-titled collection of short stories “Fire-Watcher’s Night” (1944) was billed as the first in a new “Red Band” series – and may indeed have had its genesis in nights of fire-watching. The series is labelled “completely irregular” by the British Library and I don’t know which, if any, of the following titles were also part of it. Hubin notes that some of the four stories are “criminous”, and one at least “Cuthbert Pistlethwistle and the Ghost” sounds like a ghost story. It is said that the collection was later reissued under the title “The Professor’s Drug” – the title of one of the other stories. Perhaps it was too many years of staring at balance sheets that led to the wittily titled “Squaring the Triangle and other Short Stories” (1944). It comprises ten stories, including “Love at Dark Sight”, “Psychomigrology”, “Slimming” and “War Flash, A.D. 1975”. The six stories in various styles of “Hot Swag” (1945) include “The Passing of the Dictator” and “Returning a Wife”. Not all of the stories in “The Naked Foot” (1945 or 1946) are new. 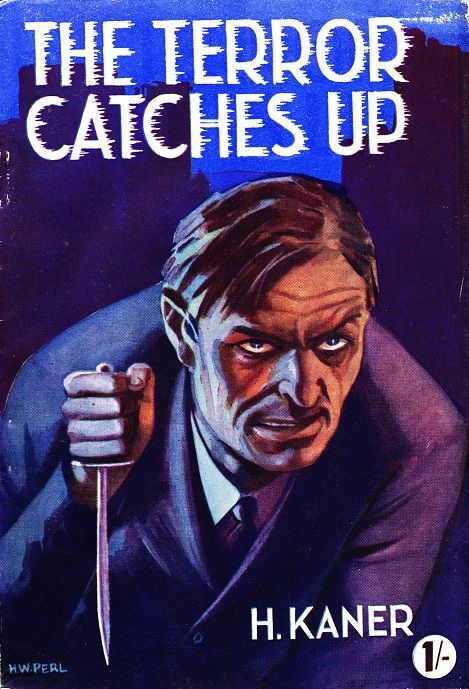 These were followed by “A Lady Screams”; “The Cynic’s Desperate Mission”, “The Terror Catches Up”; “Ape-Man’s Offering” and “An Alibi Too Much” (all apparently 1946). Some of the stories had appeared before, but new ones included “Prize-Winning Bride” and “Emergency Wife”. 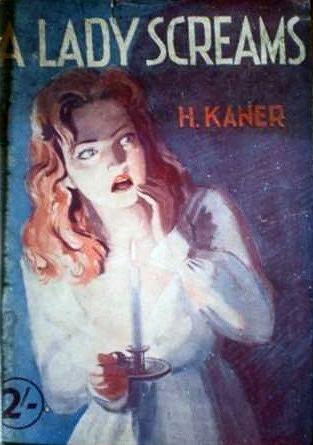 All of the above titles are scarce, some exceedingly so, but for reasons that are not at all clear (perhaps simply a matter of over-production in the first instance) Kaner’s two best-known titles, his novels “The Sun Queen” and “People of the Twilight” (both 1946), are also much the most common. 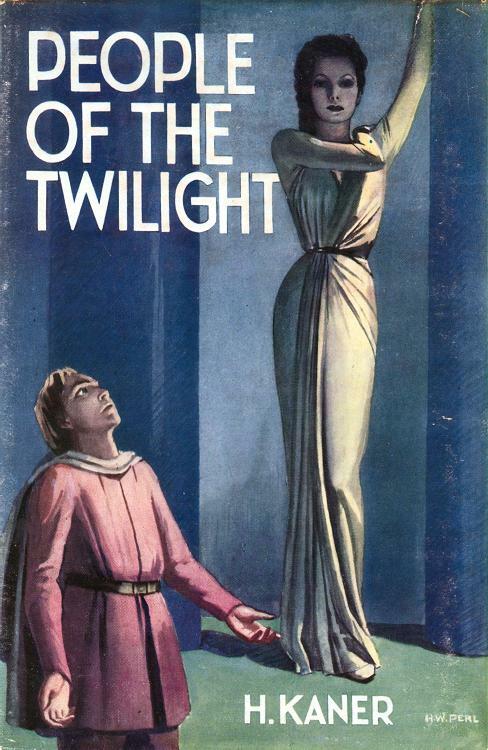 Both are science fiction, the first, incorporating (we are told), “many novel theories and ideas”, sees Roger Marshall and his girlfriend Joan Lorimer teleport themselves into a sunspot and find the Sun Queen engaged in a terrible war against the Black Knights and the evil superstition of the Rock God. In the second, Professor Hayton discovers a gateway drug to an amazing and idyllic parallel world – but shatters the peace and happiness of a lost race. 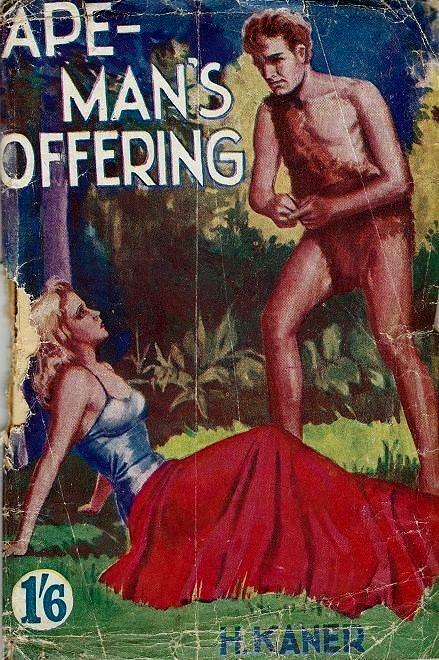 Although Kaner produced one more collection of his own stories, “Ordeal by Moonlight” (1947), including “A Deal in Husbands”, he now switched briefly to publishing the works of others. There were a handful of popular favourites – Louisa May Alcott’s “Little Women” (1947); R. M. Ballantyne’s “Martin Rattler” (1947); W. H. G. Kingston’s “Manco, The Peruvian Chief (1948), and Robert Louis Stevenson’s “Treasure Island” (1949). There were some short stories from Hamilton Enterkin in “Dames out the Ring” (1948); a book called “Guns Up – Pronto! !”(1949) from Jeffrey Parlick, and, most notably, some science fiction from John Russell Fearn in the form of “The Slaves of Ijax” (1947) – as well as three westerns from the same hand: “Rustlers Canyon” (1947); “The Avenging Ranger” (1948) and “Yellow Gulch Law” (1950). This last title was published at Harrow after the Kaners had returned to the London area in or about 1949. In that year they were living at 70 Gayton Road, Wealdstone, with Morris Hashfield also in residence. Kaner’s publishing career then came quietly to an end with Cliff Rogers’ “The Dame Laughed” (1952). The Kaners subsequently moved in succession to Chiswick, Twickenham and Barnes. Lily Kaner died early in 1965 – Hyman now simply referred to at the granting of probate as a chartered accountant. He himself died at Hendon on the 21st August 1973, shortly after his seventy-seventh birthday. This entry was posted in Book Collecting, Dust-Jackets, Forgotten Authors, Pulp Fiction and tagged H.W.Perl, Hyman Kaner, Llandudno, Science Fiction. Bookmark the permalink.